A person’s home is among their most valued treasures, that’s why the concept of aging in place is taking root for homeowners who are thinking about where they’ll spend their golden years. The majority of seniors 65 and older are currently living with either a spouse or alone in their home. Many of these homeowners could benefit from having a “forever home”–a home designed to match their needs as they age-in-place and remain in their home. How important is preparing your home for aging in place? By 2030, the U.S. Census Bureau reports that there will be approximately 71.5 million Americans over the age of 65. That figure is nearly 20 percent of the entire projected U.S. population in 2030. Being able to remain in your home for life is what many people want but that’s not ideal if the home isn’t accommodating. When you decide you want to age in place, it’s important to consider how your home will need to change. Safety, function, and aesthetics are all important but the primary concern is making it safe for you in the future. For instance, a multi-level home without an elevator often isn’t suitable and, in some cases, is dangerous for seniors. When we design forever homes, we think about how you’ll use the space years and even decades later. The home doesn’t necessarily have to have an elevator put in it right away, especially if it’s not currently needed. However an elevator can easily be added later, if during an earlier remodel, the home was designed for the possibility of installing an elevator later. This can be done by vertically aligning two closets on the upper and lower stories of the home and creating the necessary electrical wiring. Then, the closets can later be easily converted into an elevator. Small to large modifications can be made to enhance the home and prepare it for your needs in the future. 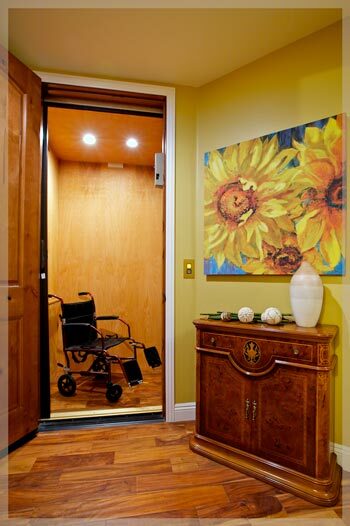 Creating a wider doorway provides room for wheelchairs without making the doorways look unusual. In the bathroom, attractive grab bars can be added as part of a design feature that will later be highly useful for seniors. If you don’t want a grab bar now, during a bathroom remodel, plywood can be added behind the tile. Prepping for the addition makes it easy to later add a grab bar without having to tear out and ruin the tile or do a whole new re-tiling. Another feature that is prominent in aging-in-place homes is curbless or walk-in showers that make it easy to step into or roll a wheelchair into the shower. There are also walk-in or roll-in tub and shower combinations that include a convenient seat. In the kitchen, modifications can make it easier for seniors to continue to perform every-day tasks by lowering kitchen countertops, raising the dishwasher up to prevent strain when loading and unloading, installing a shallow or even motorized sink that raises and lowers, and hands-free or lever-handled faucet that can be mounted on the side so it’s easy to reach. Cabinets can be designed with convenient pullout shelves, something everyone loves at any age. Aging-in-place homes, can have pull-down shelves in the upper cabinets to help make items easily accessible. Also, knobs or handles on cabinets and drawers can be replaced with a “D” shaped pull that helps make it easier to open and close them. If staying in your home in your golden years is appealing, how can you find the right remodeling company to help with your home renovation? AgeinPlace.com recommends hiring a general contractor that specializes in aging in place and has certified aging-in-place specialists on their team. The designation shows their commitment to learning about aging-in-place modifications for the home and keeping up-to-date with important industry changes and trends. Watch the video to learn more about how Marrokal Design & Remodeling creates aging-in place homes.